On the way home from work today, CBS 880 am said, "Get ready for the rain!" 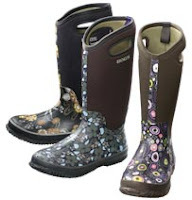 I smiled a big grin, because a) I like rain and b) I've got some adorable new rain boots. I've lived 33 years on this earth without rain boots, so I feel like the $85 dollar price tag is justified. I told my husband they were $45. My Bogs boots are thick and sturdy, with cushy soles and neoprene insulation, so I can use them in the snow, too. They come in 2 cute patterns- brown with pink swirlies, and black with yellow abstract flowers- and have handles on the side for easy pulling on. I got the boots at my favorite shoe store, Hawley-Lane in Bull's Head shopping center. Don't think this store is only for old lady shoes, although they do have quite the selection of orthopedic shoes. They have an enormous selection of men, women, and children's shoes, many of which are very stylish. I'm wearing a slick pair of black leather boots that I just bought today. I have terrible feet, so I pretty much only shop at Hawley-Lane. They've got running shoes, Reef flip flops, heels, boots, socks, leather sprays, insoles, and now they've got purses! The service at Hawley-Lane is incomparable. The staff is patient, so freaky-footed people like me don't feel stupid trying on 15 pairs of shoes and walking around in each pair for 5 minutes. They've got a whole wall of kids' shoes, and a whole room of men's shoes- flip flops, athletic shoes, casual shoes, and really good-looking leather work shoes. If I were a man, this is where I would shop for shoes. It's calm, unlike a harried department store. I am currently pretty much in love with the Bull's Head shopping center. If you've got a thousand bucks or two, you can get some nice trinkets at Grunberger Jeweler. I suggest you go window shop. The shopping center also houses Margot Cafe and Wine Bar, my favorite convenience store, Zen Spa and Nails, Kam Pei (fair to mediocre Asian food), stellar Liz Sue bagels, and some other stores I don't usually go to, but appreciate knowing are there: a dry cleaner, a children's clothing boutique called Kaleidoscope, a bakery, a mattress store, and a soccer store. I mean, rock on. I think I was there when you mentioned to the husband that they were only $45. I need to check the store out though after your rave reviews! Like those boots, they are so good looking. I had the exact opposite experience (rude, obnoxious service) at Hawley Lane last year and vowed to never go back. The only time I went to Hawley-Lane I had terrible service.